After years spent carefully emulating analogue in software, Arturia made their first move into pure hardware with the MiniBrute. This, it transpires, was only the beginning because, having fixed everyone’s attention on the looming MatrixBrute, another analogue product — a drum machine — was quietly announced, to the sound of jaws dropping everywhere. The DrumBrute isn’t some shy, miniature, apologetic first attempt. Its panel is spacious, confident and serious and its sequencer is equally suited to real-time or step-time programming. And just in case some of its sounds can’t be massaged into the right shape with the generous array of knobs, there are a dozen individual outputs. 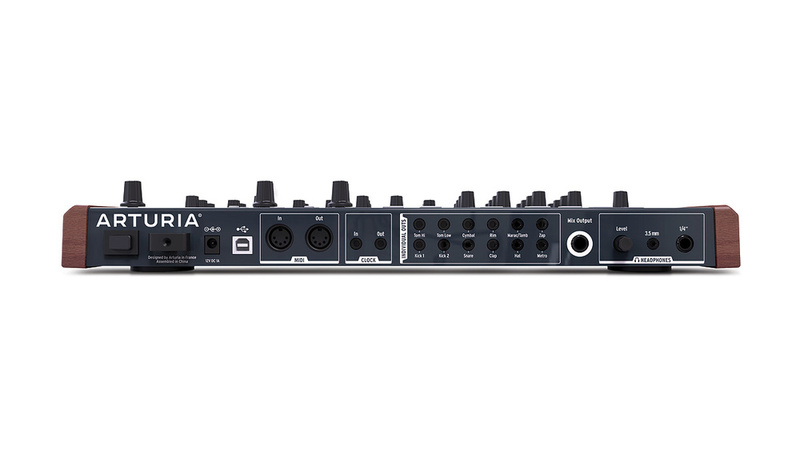 Reaping the rewards of past product development, Arturia opted for a 12dB dual-mode Steiner-Parker filter, velocity-sensitive pads, performance effects and a set of clear, readily-accessible synchronisation options. Having taken a moment to feast your eyes and let it all sink in, you might be interested to learn how much it will cost. If you aren’t pinching yourself already, that might change when you learn the answer. 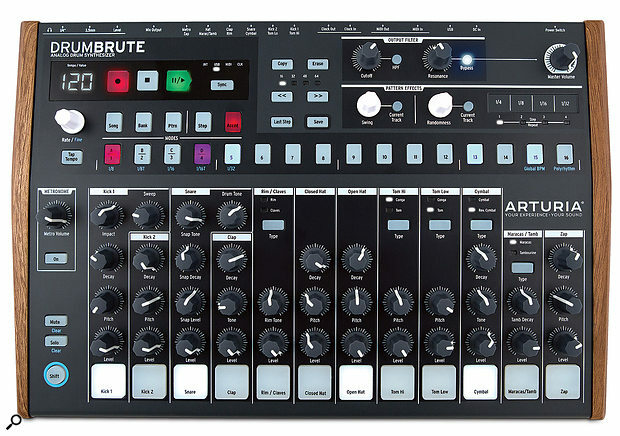 To my knowledge, the DrumBrute is currently the sole member of the Brute family not fitted with Brute Factor (a versatile filter distortion). Its name makes sense though; after all, it’s a hulking and substantial (3kg) metal beast, threatening to smaller drum machines. Brute or beaut, it looks exactly as a drum machine should, which is to say its controls have plenty of operating room and in most cases perform only a single function. The knobs and pads respond well and colour is both wisely and tastefully employed: no button or control lights up unless there’s a good reason for it. Actually, there’s one tiny exception to that rule in the form of the strobing ‘Vegas Mode’ which kicks in after five minutes of inactivity. Fortunately this can be disabled using the MIDI Control Centre, Arturia’s now-familiar means of interfacing with their hardware products. I’ve never thought of wood as being particularly important to a drum machine, but having quickly become used to it, I wouldn’t have it any other way. The end-cheeks finish off a design that is both attractive and intuitively laid-out; anyone would think Arturia had been making drum machines for years! 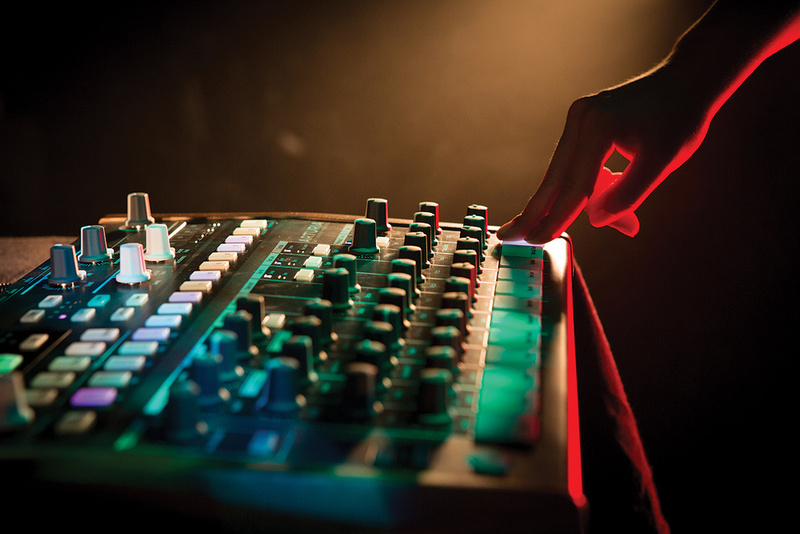 Admittedly, there is some history in the form of the Spark and SparkLE controllers, but rest assured, instead of computer-based software and samples the DrumBrute generates its percussion exclusively from analogue circuits. 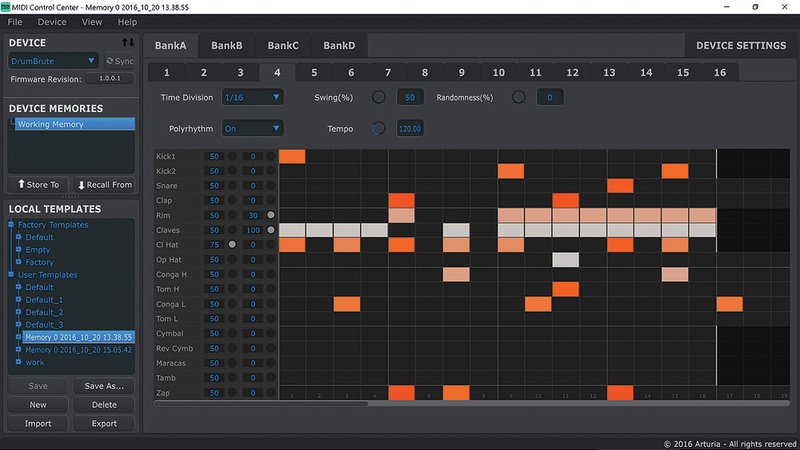 With a total of 17 drum voices, quirks such as per-track randomisation and a song mode to create basic structures, the DrumBrute ticks more boxes than an Amazon warehouse felt tip. To keep the size to manageable proportions, some of the instruments share a channel; in such cases — eg. the rim and claves — an LED indicates the current selection for recording, erasing, copying etc. The lowest knob on each channel is dedicated to volume and while not so fast to use as a row of sliders, it keeps the panel size at a manageable but still significant 418 x 276 mm. I briefly mentioned that synchronisation is well-implemented, and so it is. The four-position Sync switch sets the source from either: internal, USB, MIDI and Clock. Clock is also transmitted (via mini-jacks), making the DrumBrute a potential master in a MIDI and analogue setup. Boosting its master clock bragging rights even more, you can choose either pattern-level or global tempo, with tempo accurate from .00 to .99 resolution, set either manually or via the tap button. Unusually, the DrumBrute is equipped with both mini and regular jack sizes for its headphone sockets, plus a dedicated level control that springs out of the rear when you press it. The single main output is full-sized also. The 12 individual instrument outputs don’t fare quite so well, their mini-jacks the only visible example of corner-cutting. I was about to remark that it was difficult to imagine so many quarter-inch outputs fitting in, until I realised I didn’t need to imagine it; MFB showed the way on their Tanzbär drum machine. That gripe aside, I armed myself with a mixture of Doepfer ‘little to large’ leads and various adaptors, then connected the main output, two kicks, snare, clap and high hats to a mixer and prepared for percussive pleasure. You won’t be surprised to learn that as you make a connection to each output, that instrument is removed from the main (mono) mix and also the headphones. Naturally, the connection removes it from the influence of the analogue filter, because the filter is tied to the main output, something to bear in mind when you’re deciding which instruments to patch out for external processing and EQ. Power is via an external adaptor, USB supplies easy computer dialogue and the MIDI ports (in and out) are the correct size. It’s pretty busy round the back of the DrumBrute, with MIDI and Clock I/O and 12 individual outputs on 3.5mm sockets. There’s also a quarter-inch main output and, unusually, a choice of quarter-inch and 3.5mm headphone ports. I’ll start where any analogue lover would, by checking out the available sounds. I kicked off with Kick 1, which clearly has some kind of 909 inspiration; it’s hard and punchy even before you introduce ‘impact’. Impact is a brief transient, like a very short crackle, and is ideal for adding extra definition or edge to the kick. Control is offered over pitch, decay and sweep, the latter a pitch sweep that, for me, never quite hits the mark. The more I played with this kick, the more I felt it would have benefited from a slight downwards shift of its operating range as I seemed forever to be trying to take it lower, despite being at the minimum already. Fortunately, a little external processing works wonders. The second kick is pitched lower — much lower. It’s also smoother and more 808-like in tone. Having a wider pitch range than a real 808 adds to its versatility, and even though its deepest extremities are more weapon-like than instrument, it’s a storming kick. The snare is another cracker and an original Arturia design to boot! It consists of a body and noise component with the noise’s level, decay and tone all widely variable. When accented it becomes slightly distorted and its tone control applies filtering to move between a high, nasal burst and a deeper, fuller tone. It occupies territory somewhere in the 606 and 808 ballpark but I’d rate it as cooler than either. The body component can be independently tuned and almost every combination of the controls produced something sweet. An instant favourite. Continuing our journey from left to right, we reach the clap; its Tone knob involves another filter sweep, this time with a band-pass flavour. Based on the Delptronics Thunder Clap, it’s a welcome departure from Roland claps and maintains its chirpy character over a wide spread of decays, although an extension to the maximum time might have been nice. Rimshot’s tone transitions from a short ‘donk’ to a woodblock-like click, while the claves are short, distinctive and not quite a Roland copy. As with all shared voices, claves and rimshot share a volume control but can be programmed separately into patterns. Turning to the hi-hats, both appear based on the same circuit. By dividing them into two channels, you’re able to fine-tune the level, pitch and decay of each — or make them identical. However, since they share an output there’s no way to process either one differently should you fancy doing so. I suspect the hi-hat’s raw sound will prove to be an acquired taste. It’s noticeably crunchy and metallic, with traces of shimmering modulation. The pitch knob provides fairly subtle cross-fade between a hat loaded with noise and distortion and a purer, more ringing version. While unlikely to delight lovers of silky, noise-based hats, much can be done with external processing — or treatment through the on-board filter in its high-pass mode. The toms and congas consist of shared level and pitch controls for each drum (high and low), but despite the lack of a variable decay, they are solid and credible. Tone-wise, they sit squarely in TR808 territory but with a touch of extra woodiness. When accented, the congas gain a distinctive click, which is nice. The cymbal has some similarities with the hi-hats, but its metallic sizzle is tuned higher and is less brash in tone. Spinning the Tone knob clockwise emphasises deeper ringing tones and adding accent makes the crash dirtier. It’s a useful cymbal that, at its shortest decay time, can be a decent hi-hat. It features a surprise alter-ego too, in the form of reverse cymbal, which is not an instrument you’d expect to find on an analogue drum machine! Perhaps the reverse version is a fraction low-pitched but it’s a welcome inclusion all the same. Both forward and reverse cymbals share a decay control, so a short regular cymbal equates to a short reverse. Maracas is the familiar soft-attack noise burst, always ready for a spot of the old cha-cha-cha. Its channel partner, tambourine, is another highlight. Containing a rattlesnake-ish modulation wobble, the tambourine’s variable decay serves up everything from brief slaps to rain-stick-like swooshes at its maximum. The final instrument, zap, is not quite the Kraftwerky fast blip you might have expected had you read Arturia’s list of prospective ‘customer types’. Zap has an unfortunate tendency to veer away from ‘Man Machine’ and head straight for the disco. Its decay is a pitch sweep starting at pure cheddar but reaching a fairly satisfying thump in the nether regions. If you set the initial pitch as low as possible, zap isn’t far off being an extra kick. As with many of the voices, accents are slightly higher in pitch. Taken together, it’s a solid and coherent assembly of analogue voices without a cowbell anywhere, which is absolutely fine with me! The knobs have no alternate functions nor is MIDI control of them possible; what you see is what you get. The DrumBrute’s front panel measures 418 x 276mm. If you’re resolved to reinvent the analogue drum machine, a versatile set of voices is only half the story. The other half is the sequencer, and this one clearly benefits from Arturia’s recent experience in the field. With four banks of 16 patterns, each up to four bars long, filling them is a pleasure whether you’re into the X0X-style of programming or a more natural process of hitting pads. Lovers of step entry are assisted by a dedicated row of buttons showing active steps and accents, plus a flashing activity display via the backlit pads. When starting from an empty pattern, I found the metronome to be an instant bonus. It’s complete with a level control and dedicated output — darn useful in a live situation. Real-time recording is very straightforward, as long as you remember that the drum voices are not velocity-sensitive in the usual sense. The sequencer does record the full range of pad velocities and transmits them on playback too. But the internal voices only respond to two velocity values: regular and accented. A setting in the MCC software specifies the threshold beyond which a pad hit is considered to be accented. Since no MIDI data is transmitted from the knobs, it follows that the sequencer cannot record knob movements, filter sweeps, etc. It’s not exactly lacking in fun features, though, many borrowed liberally from the BeatStep Pro. Patterns can run at half or double speed and be switched to triplets whenever the mood takes you. Intelligent data handling and dedicated buttons ensure the minimum of hassle when it comes to adjusting pattern length, erasing data and so on. Actually, I’d barely registered until this point that there’s no display, but who needs one? When you need to extend a pattern, copy data from one channel to another, erase entire instruments or wipe patterns, all is achieved in a few button presses. The save process is a little different to that of the BeatStep Pro though. For a start, you can only save to the current pattern location and to do so, you must first drop back to Pattern selection mode. If you begin modifying a pattern then wish to save elsewhere, Copy is required instead. After a few minutes trying the various options, there shouldn’t be anything confusing but be aware that the step keys are used for pattern selection and X0X-programming, so you need to mentally register the status of the Pattern/Step/Accent key to avoid data loss by accidental pattern changes. Perhaps the sequencer’s most impressive feature is its implementation of polyrhythms. When this is enabled, every track can be given a unique length, from one to 64 steps. Thus every drum voice can loop independently, which is brilliant for adding extra movement and unpredictability to your patterns. For example, you could make the open hi-hat track an odd length, which will cause it to move unpredictably against a rigid pattern of closed hats. This trick would have been even more effective if choking had been implemented differently. Right now, the closed hi-hat takes precedence over the open one, so those few roving variations are lost. The work-around is to swap the two hats around, reversing their decays, but perhaps user control of choking priority might be added to the firmware later. Setting the length of an instrument track is as simple as holding the Last Step button and the relevant step key. All tracks share a common timebase, though, so you can’t sneak in a sneaky triplet rimshot, for example. We haven’t exhausted the sequencer’s repertoire yet. Another helpful inclusion — especially if you’d like to temper some of that 16th-note hi-hat rigidity — is Step Shift. It’s engaged by holding a step button (or several together) and then turning the Swing encoder; the selected steps will be shifted forwards or backwards against the otherwise tightly-quantised grid. Oddly there’s no equivalent means of shifting the whole instrument forward or back, but perhaps that’s another enhancement to be implemented further down the line (as it was on the BeatStep Pro). When trying out the shift function, I noticed an occasional anomaly in which moving a step could interfere with the playing of subsequent steps. Last but not least, you can specify between one and four repeats to occur on any step. The function is enabled by holding the relevant step key along with the repeat button. Having done so, a white LED lights. Currently, although you can modify the selected repeat option afterwards, you can’t remove it entirely, except by wiping the whole instrument track! You can disable the step of course but whenever you bring it back in, the repeat is restored too. Hopefully this can change in the future. The four membrane pads that introduce step repeats can also act like an MPC Note Repeat — for as many pads as you can touch simultaneously. This ‘Roller Mode’, as Arturia call it, only works when in real-time record mode, though. The obvious flaw is that, since you’re recording, the rolled notes are captured into the pattern. It never, therefore, matches the ‘quick fill’ functionality of an MPC or Electribe. Additionally, if you trigger fast 32nd-note repeats like this, the record process quantises them to the current pattern resolution on playback. The Song Mode implementation is so simple there almost isn’t anything to report — it just works. Songs can be assembled while you play, they’re 16 steps long and can feature any pattern from the 64 available. Should you want a pattern to play multiple times, it costs multiple steps — no step repeat is implemented, nor are track mutes stored for each stage either. In total, there are 16 songs that loop smoothly upon reaching their end. The MCC software in action. Solo and Mute are separate modes that replace the pads’ normal functionality. In either mode you specify the instruments to be included and these are instantly recalled whenever you engage Solo or Mute. It’s therefore like having two alternate mix groups always available. Clearing either mode is as simple as using Shift and the respective button. One slight issue arises when you wish to play some instruments manually while keeping others muted. Suppose you’ve muted a series of tracks to break down into an ambient middle section. Next you might want to trigger that lovely reverse cymbal prior to bringing the whole lot back in. As it stands, you can either have some tracks muted or trigger the cymbal, but you can’t do both. One work-around could involve setting triggers in step mode, but it’s not ideal. Ultimately, a means of keeping tracks muted but having play access to the pads would be much appreciated. I mentioned earlier that the main output is processed by a 12dB/oct Steiner-Parker filter that’s switchable into low- or high-pass modes, but what I didn’t emphasise was how much value this adds to a drum machine. The filter is a treat, whether adding a resonant sweep to an entire pattern or processing the few instruments you didn’t pipe out for individual EQ and effects. Splendid though it is, especially in its high-pass mode, it’s impossible not to pine slightly for the harder, dirtier edge Brute Factor would have given. Perhaps the omission is a cunning ploy to sell more Microbrutes? Beneath the filter are two white encoders for introducing Swing and Randomness. Both are accompanied by a button to confine the process to the current track if necessary. This means you can indulge in different amounts of randomness for each instrument, and even different amounts of swing if your hips can cope! The randomness differs slightly from the BeatStep Pro in having just a single control, but its behaviour can be personalised to taste in the MIDI Control Centre. Randomisation on a sparse instrument track adds extra triggers, while on a busy track it removes them. A little well-chosen randomness on a couple of instruments is a delight. Equally, cranking it up across all tracks can be heaps of fun too, especially if you prefer your fills and breaks on the manic side. After you’ve filtered, swung and been tastefully random, the last performer’s tool is another not seen on many drum machines. The Looper will be very familiar to users of the BeatStep Pro. We’ve already seen how those four buttons produce rolls when in real-time record, but outside recording, they play short loops instead, ranging between four steps and a 32nd step loop. You can move the loop start point around dynamically by pressing different step keys. The DrumBrute helpfully keeps track of the pattern’s progress so when you release the loop button, it continues from where it would have been. You could design the most innovative drum machine with the friendliest interface since the light switch but if you fill it with drab, uninspiring voices none of that matters. Arturia have carefully assembled a collection of new and familiar-sounding analogue percussion in a form factor that’s practically irresistible and at a price not much higher than some Eurorack drum modules! Seriously, what’s not to like? In particular, the 808-style kick is loaded with presence and the snare is a cracking original creation. And if the hi-hats divide opinion, the clap, tambourine, reverse cymbal and toms more than make up for them — they’re top notch. In most cases you’re given sufficient tonal control over each voice, but if you can’t get the sound you want, those individual outputs are a blessing. Despite receiving a DrumBrute prior to release, I had only a few minor operational glitches, but I’d expect an update or two as more users put it through its paces. Whether my own wishes are granted or not, I can’t think of a more complete analogue drum box than this for building patterns from scratch, assembling them into songs and, above all, performing. Polyrhythms and randomisation will keep your patterns sounding fresh, while other neat extras such as the analogue filter, step repeat and the looper pile on the reasons to be brutalised. Until now we’ve come to believe that any serious analogue drum machine must be prohibitively expensive and have grown used to accepting compromises instead. With the DrumBrute, Arturia have created what many of us have desired for years and have done it in their own particular style. Highly recommended. For pure analogue percussion, the most obvious alternative is MFB’s Tanzbär (reviewed SOS November 2013). It’s not so affordable, is rather small and has a UI that can be challenging, but it sounds awesome and its 14 voices are all individually accessible from full-sized jacks. The Tanzbär features polyrhythms, per-step parameter recording and full MIDI control of every knob, and MFB make a nine-voice Lite version at a price closer to the DrumBrute. Roland’s TR8 (reviewed SOS April 2014) is another contender worth considering. Packed with classic sounds and with expansion packs available to boost it further, the TR8 features built-in effects but just a pair of individual outputs. 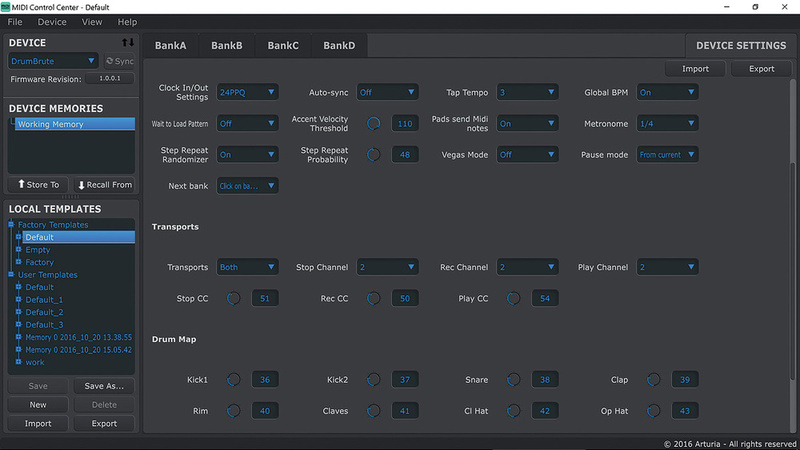 Arturia provide the MIDI Control Centre as a vital means of backing up and restoring patterns, as well as tweaking parameters not available from the front panel. 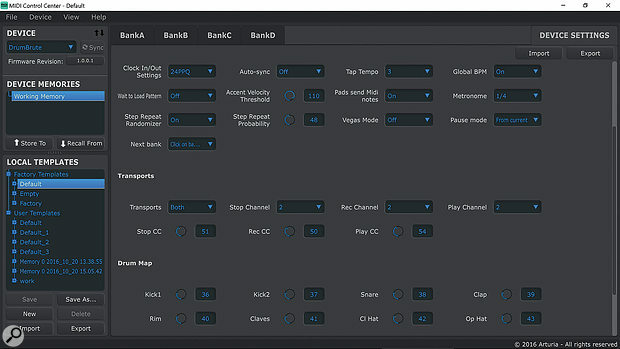 The list includes setting the MIDI channel, metronome division, Clock I/O settings and behaviours such as how banks should switch during playback. It’s here that you set the note mapping for the drum pads and personalise the randomness parameters and step repeat functions. Arturia’s MCC software — that’s ‘MIDI Control Centre’ not Marylebone Cricket Club. The DrumBrute is a class-compliant device, so all you need to establish two-way communication is a USB cable. Like it or loathe it, the MCC is essential for firmware updates and even offers graphical editing of patterns. An affordable analogue drum machine with a superior user interface. It sounds great — some voices are superb. The individual outputs are on mini-jacks. A few parameters would benefit from a wider range. It doesn’t take a crystal ball to predict Arturia are going to sell loads of these. 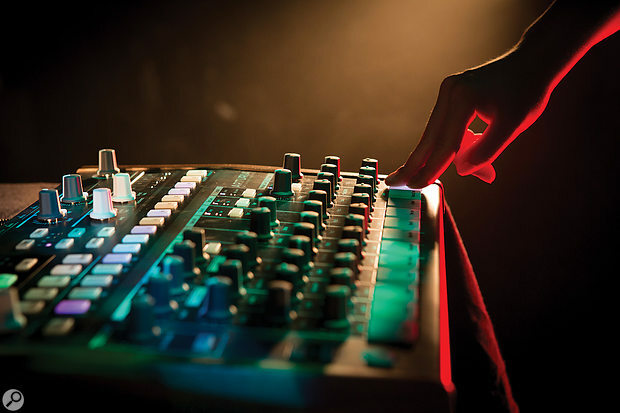 The DrumBrute sounds great, offers scope for individual instrument processing and is loaded with performance potential. With some software refinements it’ll be even slicker.